Persimmon recipes are delicious mixed with pomegranate seeds. 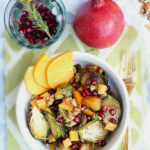 This comforting pomegranate salad combines roasted persimmons and nutty Brussels sprouts in a a sweet maple dressing. 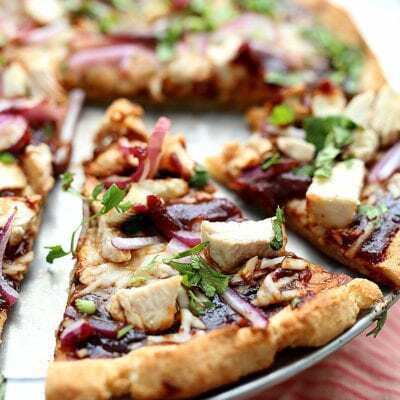 It is bursting with the tart and tangy flavor of freshly chilled pomegranate seeds and crunchy persimmon. 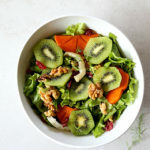 Pomegranate salad recipe! There is something about mixing pomegranates and persimmons together that brings about a holiday meal’s finest flavors! And boy do I love the holidays and holiday food. 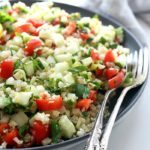 This roasted salad is perfect for Thanksgiving or Christmas, which I can’t stop thinking about how it is right around the corner! How is it the stores are already packed with Santa and Christmas trees already?! 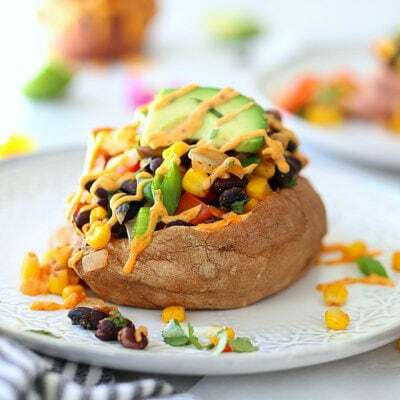 A bonus is this vegan pomegranate salad is loaded with antioxidant immunity boosting nutrients during the upcoming cooler months. 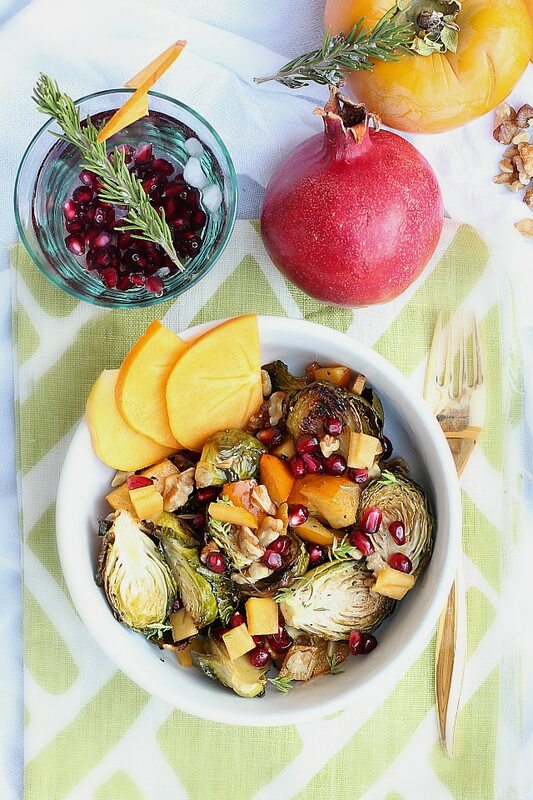 You have totally gotta try this combination of raw pomegranate seeds and roasted persimmons, Brussels sprouts and walnuts in a warm sweet maple dressing for your holiday feast! If you are not familiar with persimmons there are two well-known kinds: hachiya persimmon fruit and fuyu persimmon fruit. Hachiya persimmons are soft when they are ripe, similar to a juicy tomato and tastes incredible sweet. If they are hard they taste bitter and make your tongue do a dried up dance. Seriously, you will definitely know when they are unripe because the persimmon taste will make your tongue feel dry and tingly. But when they are soft and squishy they ripe and perfect for making into jams or persimmon bread. Fuyu persimmons are my favorite. 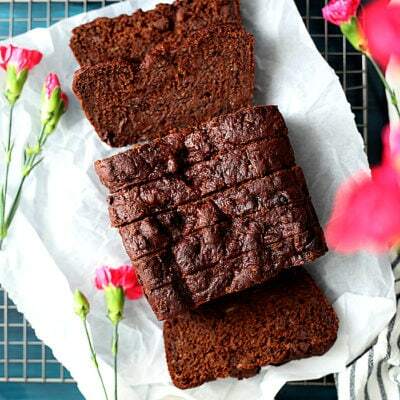 They are hard when they are ripe, slightly sweet and resemble the consistency of an apple. 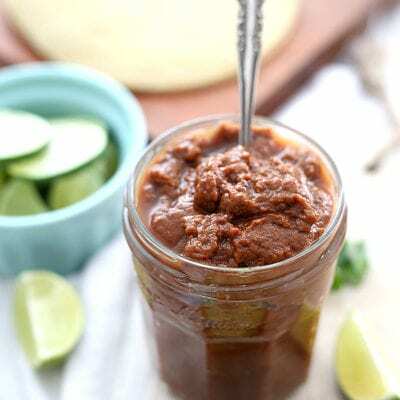 Perfect for adding crunch to a leafy green healthy pomegranate salad or to add sweetness to roasted Brussels sprouts. Persimmons and pomegranates were foreign fruits when I was growing up on the east coast. 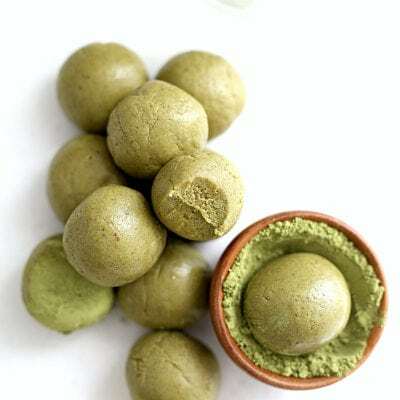 They were not introduced to me until about 6 years ago when a friend would bring us bags of her plump sweet fruit. I started eating them like a tomato but they were too messy and my husband did not like the soft texture. Years later my friend introduced me to fuyu persimmons and it was love at first bite! Now we have a beautiful persimmon tree blossoming outside our kitchen window and I can’t stop eating them! Well what goes fabulous with persimmon? Pomegranates of course! Just be aware that your kitchen may look like a blood bath when trying to get the seeds out. The trick is to fill a bowl with water and break open the pomegranate. Then carefully remove the raw pomegranate seeds in the water so the juices stay contained. 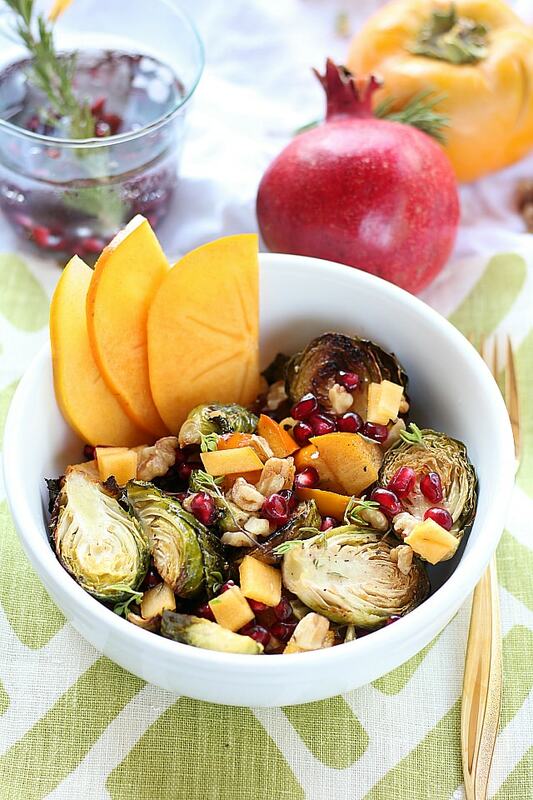 Rinse and then you have a delicious garnish for this pomegranate salad with persimmon and Brussels sprouts! Pomegranate seeds are also lovely in baked goods, as a garnish, sprinkled over a salad, in smoothies, cocktails, juice or eaten alone as a healthy snack. How to eat persimmons? Simply slice off the top and cut vertically like you would an apple. Then dice it into small ¼ inch to ½ inch cubes. 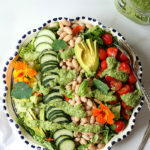 Now the dressing is my favorite part because maple syrup brings all the sweet and nutty flavors together. 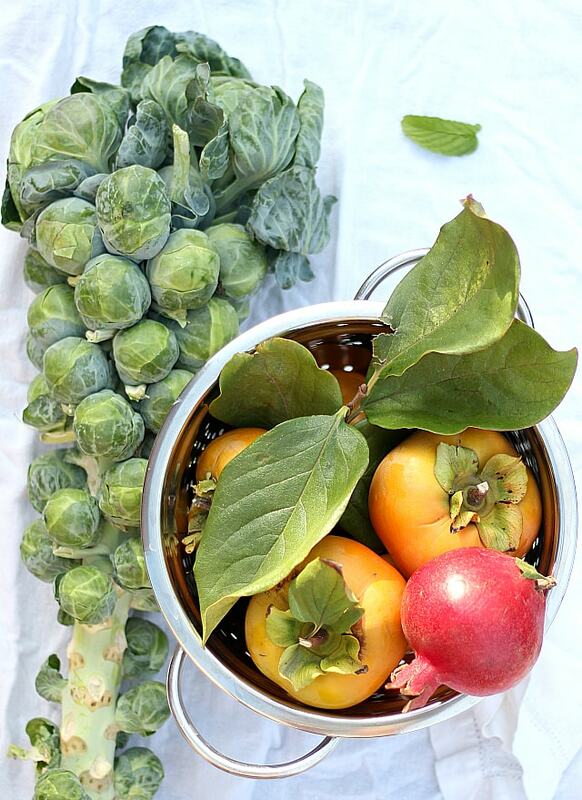 I love to drizzle the maple syrup on the Brussels sprouts and persimmons before roasting. That way it slightly caramelizes with the oils and natural sugars. Then after it is roasted add a slight bit more if desired. For maximum bursting flavor this pomegranate salad mixes both roasted persimmons with raw persimmons. Roasting sweetens up half the batch and the remaining raw ones adds the perfect crunch with juicy pomegranate seeds and walnuts. 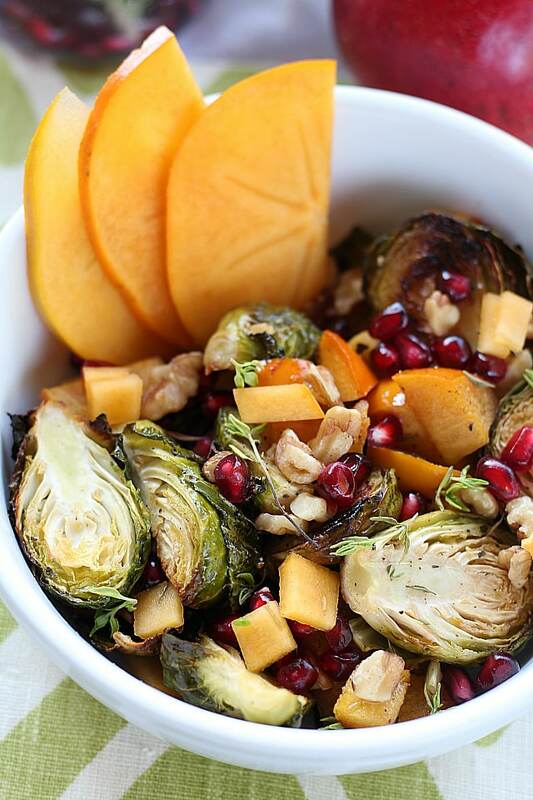 In a large bowl add the Brussels sprouts, celery and 1 cup of diced Persimmon. 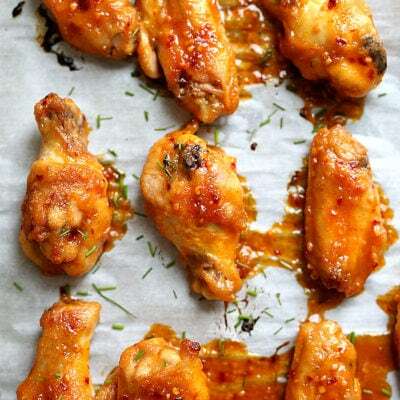 Add 1 Tablespoon of maple syrup, 2 Tablespoons of olive oil, salt and pepper. Toss to coat then spread out evenly on the baking pan. 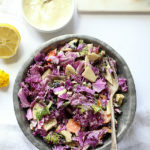 In a small bowl whisk together the dressing: remaining 2 Tablespoons of olive oil, apple cider vinegar, 1 Tablespoon of maple syrup (or Birch Xylitol), Dijon mustard and lemon juice. Set aside. 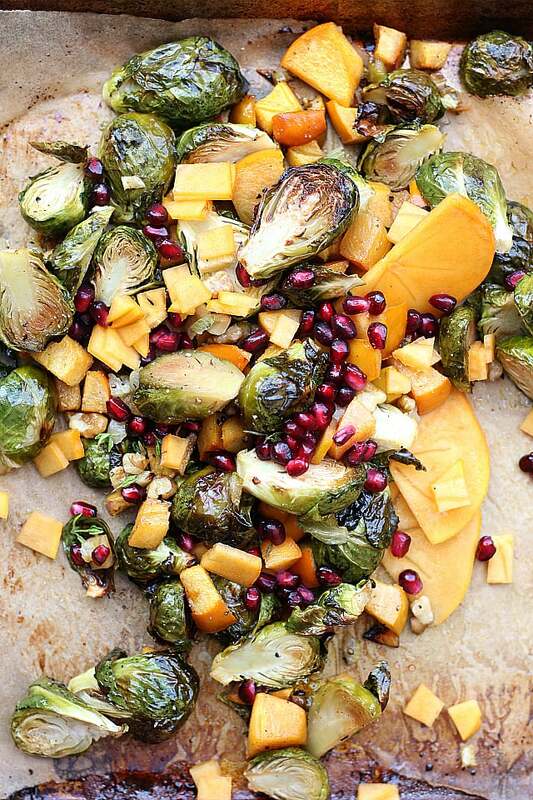 Roast the Brussels sprouts and persimmon for 40 minutes total, flipping every 10 minutes to prevent burning. 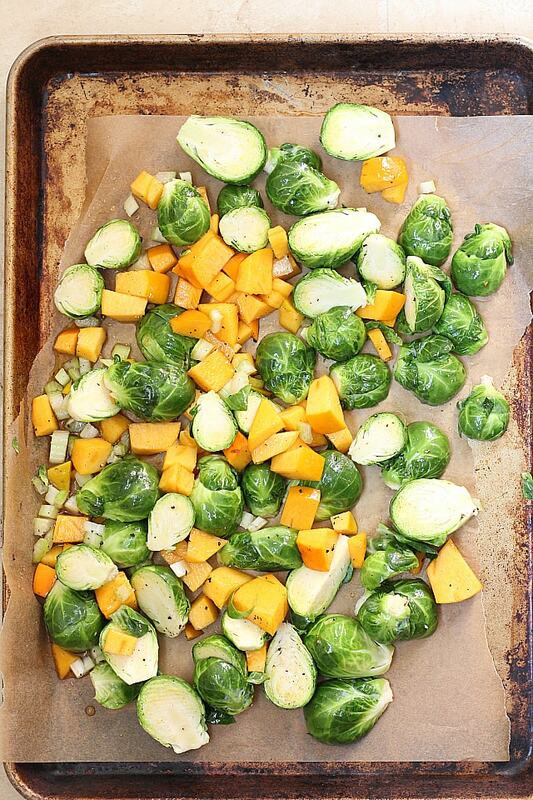 When the roasted Brussels sprouts and persimmon is done remove from the oven and add to a large bowl. Toss in the extra raw persimmon, pomegranate seeds, tarragon and walnuts. Add the maple dressing and toss to coat. Serve warm or cold. DON’T FORGET TO PIN THIS POMEGRANATE SALAD!